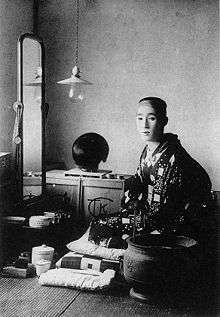 Teinosuke Kinugasa (衣笠 貞之助, Kinugasa Teinosuke) (1 January 1896 – 26 February 1982) was a Japanese actor and film director. He was born in Kameyama, Mie Prefecture and died in Kyoto. Kinugasa won the 1954 Palme d'or at Cannes for Jigokumon (The Gate of Hell). Kinugasa was among the pioneers of Japanese film, but began his career as an actor specializing in female roles (onnagata) at the Nikkatsu studio. When Japanese cinema began using actresses in the early 1920s, he switched to directing and worked for such producers as Shozo Makino before going independent to make his best known film, A Page of Madness (1926). Also called A Crazy Page, or A Page Out of Order, it was lost for 45 years before the director rediscovered it in his shed in 1971. A silent film, Kinugasa released it with a new print and score to world acclaim. He also directed the film Jujiro (known as Crossways, Crossroads, and Slums of Tokyo in English) in 1928. He directed jidaigeki at the Shochiku studios, where he helped establish the career of Chōjirō Hayashi (later known as Kazuo Hasegawa). After the war, he helmed big-budget costume productions for Daiei studios. On February 26, 1982, Kinugasa died at the age of 86. Gardner, William O. (Spring 2004). "New Perceptions: Kinugasa Teinosuke's Films and Japanese Modernism". Cinema Journal. 43 (3): 59–78. doi:10.1353/cj.2004.0017.